Lulac Glances National Supreme Council Meeting Washington, D.C., October 10, 11, and 12, 1968 Registration and reception was held in the Capitol Hill Room of the Dodge House Hotel. LULAC Nat. Pres. Roberto Ornelas opened the meeting at 9:30 a.m. The welcome address was given by the Honorable Raymond Telles and the response was given by Dr. George Garza, Past. Nat. LULAC President. Speakers appearing before the Supreme Court were: Commissioner Vicente Jiminez, Chairman of the Inter- Agency on Mexican American Affairs; Robert Weaver, Secretary of Housing and Urban Affairs; Senator Ralph Yarborough from Texas; Past LULAC Nat. Director Judge Alfred Hernandez; Secretary of Labor, Willard Wirtz. Vice President Narcisa Espinosa presented an educational proposal to LULAC. Other chairman reporting were Nat. Publicity Chairman, Moe Sanchez and Nat. Business Manager, David Adame. 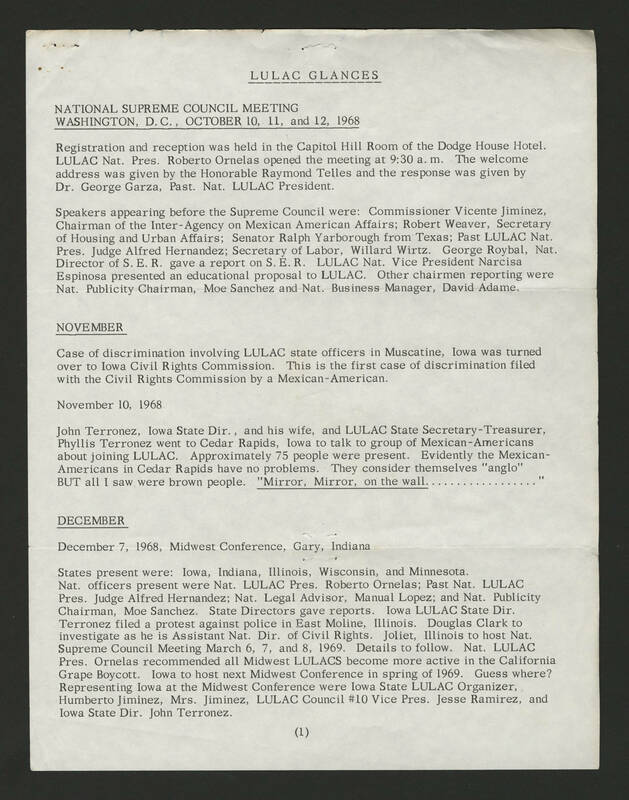 November Case of discrimination involving LULAC state officers in Muscatine, Iowa was turned over to Iowa Civil Rights Commission. This is the first case of discrimination filed with the Civil Rights Commission by a Mexican-American. November 10, 1968 John Terronez, Iowa State Dir., and his wife, and LULAC State Secretary- Treasurer, Phyllis Terronez went to Cedar Rapids, Iowa to talk to group of Mexican-Americans about joining LULAC. Approximately 75 people were present. Evidently Mexican-Americans in Cedar Rapids have no problems. They consider themselves “anglo” BUT all I saw were brown people. “Mirror, Mirror, on the wall………………” December December 7, 1968, Midwest Conference, Gary, Indiana States present were: Iowa, Indiana, Illinois, Wisconsin, and Minnesota. Nat. Officers present were Nat. LULAC Pres. Roberto Ornelas; Past Nat. LULAC Pres. Judge Alfred Hernandez; Nat. Legal Advisor, Maual Lopez; and Nat. Publicity Chairman, Moe Sanchez. State Directors gave reports. Iowa LULAC State Dir. Terronez filed a protest against police in East Moline, Illinois. Douglas Clark to investigate as he is Assistant Nat. Dir. Of Civil Rights. Joliet, Illinois to host Nat. Supreme Council Meeting March 6, 7, and 8, 1969. Details to follow. Nat. LULAC Pres. Ornelas recommended all Midwest LULACS become more active in the California Grape Boycott. Iowa to host next Midwest Conference in spring of 1969. Guess where? Representing Iowa at the Midwest Conference were Iowa State LULAC Organizer, Humberto Jiminez, Mrs. Himinez, LULAC Council #10 Vice Pres. Jesse Ramirez, and Iowa State Dir. John Terronez.